Day 220: Decisions, Decisions, Decisions . . .
Just before hopping into the Jeep (note to self – don’t trust weather forecast of sunny and warm and leave the top down – it was a misty ride to Austin today . . . we’ll just leave it at that) to head home this evening, Jean got a text from a good friend and colleague who asked “what wine are you blogging about tonight?”. Wow, not even home and the mind starting churning . . . many labels passed through her mind (kind of like visions of sugar plums on Christmas Eve . . .). Since Brian had a late meeting, Jean took it upon herself to pre-select some options from “the wine blog rack” – with the intent to make the decision easier. Once everybody was home it was decision time – – – which actually led to a fruitful (pun fully intended) discussion on how many decisions we have to make in one day and in due course, our entire lives. As babies, we really don’t consciously make decisions – or do we? . . . we quickly learn that if we cry – we get attention . . . if we soil our diaper – we get attention – – – perhaps this is where is all starts. As we get a bit older we have to decide to learn things . . . tie our shoes, wear socks that match (or not), pick out our own outfits, pick our friends – then we move into picking our classes, picking our hobbies, picking our favorite show to watch in lieu of another – then comes the big one . . . college or no college, if yes – then where? (and we’re not talking just burnt orange versus maroon) . . . if no – what’s next? After that span of time zips by it’s on to . . . date that cute guy or girl? Marry that same cute guy or girl? Start a family with that same cute guy or girl? Seems like the list just goes on and on – we neglected to mention all the little decisions that we make all the time . . . eat breakfast?, make the bed (why, just gonna be back in it shortly)?, take lunch or go out to eat?, talk to the person in the cubicle next to ours – or ignore? Watch TV or go to the gym? Change jobs to explore a new opportunity or stick with where I’m at because I’ve still got something to contribute and “get done” before I leave for my next career move? Wow – kinda wears one out when you stop to think about it. Our lives are a second by second adventure laced with opportunities known as decisions. As our daughters grew up learning, it’s really about choices and consequences – sometimes we make good decisions and sometimes they aren’t so hot and don’t work out so well. Regardless, we have to make them or we will be frozen and unable to function . . . we can attest to the fact that we’ve made good and bad on all the aforementioned fronts – but are still alive and making the most of the short-term situation called life – so, if you have a tough decision to make – make it, move on and don’t look back . . . chances are if you think you lost out on something by your decision, you actually grew from it and will be better off in the long run. So now, take a deep breath and decide or not decide to read on and see what we chose to blog about tonight. Hmmmm, red or white – dry or sweet – Cab or Zin . . . see, these are the daily perils we face – so tonight the lucky winner is . . . Concannon Conservancy 2010 Crimson & Clover. Nope we aren’t going to break into song, but we just might jump and shout. This is really a nice little wine for the price – another one of our great finds from HEB. For under $12, we were glad this little gem snuck into our basket – still not too sure who made the decision, but – – – it was a good one! Straight from the Livermore Valley in CA – which is located on the eastern edge of California’s San Francisco Bay Area – this wine treated our noses to aromas of nutmeg and mocha – kind of like coffee and hot cocoa all rolled into one. Next stop – fruitsville – what a great combination of cherry and blackberry topped off with a pinch of plum – warm and inviting on the palate. The loooooong smooth finish of vanilla and oak is what really won us over – this one will be on the “do over” list when Day 365 finally arrives. As we wrap up – here’s a toast to Louisville for bringing home the NCAA Men’s trophy. . . it was an outstanding game – however, we have to say – – GO BIG BLUE . . . Kristy, this one’s for you – can’t wait to wait the ladies tomorrow night! Could Louisville bring home both trophies? The scene is set and the die is cast. . .let’s see how the baskets fall!! While you root for your team, remember to enjoy responsibly and recycle whenever possible. 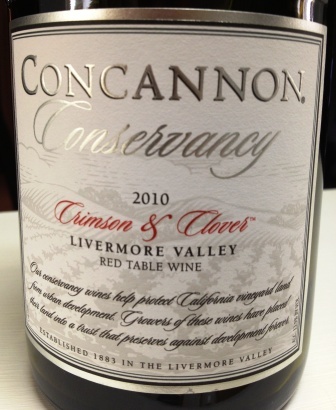 Categories: Uncategorized | Tags: CA Red Wines, california, Concannon Conservancy 2010 Crimson & Clover, Concannon wines, Livermore Valley, NCAA Final Four | Permalink. Thanks so much to my friends, Jean and Brian, for their friendship, insight and love. I look forward the the blogs eaqh day, as they are about so much more than wine! Last night was a tough night for my Wolverines – but they played with style and skill. Being the youngest team in the hunt – they have many more years of great basketball in front of them, hopefully at Michigan! So, I’m a proud alumni today and thankful that I am blessed with friends who support me and my team! Go Blue! Love tonight’s blog! 3 words: profound, humorous, and informative. 1 q: How many wines, thus far, have made the “do over” list? A three word answer – Waaaay too many!